A pioneering new initiative, called the Organic Cotton Traceability Pilot, is proving the use of cutting-edge technology to trace organic cotton through its value chain. This is an important and promising milestone in the quest to boost the traceability of organic raw materials and revolutionise the textile supply chain. “With the work we have done to trace organic cotton from farm to gin, we are confident that in the next phase we will be able to make the leap from gin to consumer, eventually making it possible to swiftly and efficiently trace organic cotton straight from the farm to the consumer. This is good for farmers, good for consumers, and good for the entire industry,” says Daniel Jones, founder and CEO of Bext360, the lead technical partner of the initiative. The apparel supply chain is notoriously fragmented and complex, making tracing garments to their origins a difficult task. Tracing material flows through the supply chain is even more challenging, especially sustainably produced raw materials like organic cotton. At the same time, the pressure for greater transparency and sustainability in the fashion industry is intensifying. Consumers are more aware than ever of the ethical and environmental impact of fashion, while governments are beginning to demand accountability from brands and retailers for their supply chains. Traceability is playing an increasingly important role in ensuring not only that sustainability claims made to the consumer are accurate, but also that sustainable producers are rewarded for their efforts. New technologies are beginning to offer brands innovative tools to efficiently and reliably verify materials, but until now these have not been successfully applied in the garment industry. This pilot initiative combines multiple technologies to trace and identify the origin, purity and distribution of organic cotton. While these technologies have already been used before other supply chains, they have not been yet been used in fashion. While blockchain technology allows for efficient integration of data from multiple sources in the supply chain, the use of machine vision, artificial intelligence, micro-biome sequencing and on-product unique markers (including the physical markers: NFC, IN-Codes and fluorescent Li-Code's) help to guarantee data integrity as well as grade the quality and purity of materials. For machine readable technologies like product markers, this can usually be done without altering the product itself. At the farm level, the solution’s digital trail is creating transparency not only by verifying the material but also by ensuring the that fair price brands are paying are reaching the farmers. Additionally, the digital trail simplifies logistical transactions for farmers and enable banks to provide them loans. At the consumer level, the technology sheds a light on the suppliers and manufacturers that are behind a final product, increasing trust and transparency. As a traceability solution that has seen success in other complex supply chains like coffee, cocoa, and palm oil, Bext360 was chosen to participate in the Fashion for Good Scaling Programme. Seeing the potential of the model, an unprecedented group of partners came together to pilot whether the technology solution be applied to organic cotton. Lead technical partner, Bext360, was backed in logistics, planning and technology by supporting technical partners Haelixa, Tailorlux, and InCode Technologies, and ongoing field trails are being carried out in Pratibha Syntex farm groups in India. Other partners include Fashion for Good, C&A Foundation, and the Organic Cotton Accelerator (OCA), as well as Kering, Zalando, PVH Corp, and C&A. 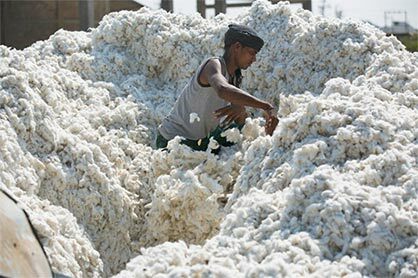 The unique mix of technology providers, philanthropic partners, multi-brand platforms, as well as brands, retailers and manufacturers all working in a collaboratively to drive traceability in organic cotton has yet to be seen in the industry. “As a global platform for innovation with many brands behind us, we are excited to see how the scaling of one of our innovators turned into a multi-stakeholder effort from which the whole industry will benefit. These technologies will improve how companies can map, audit, certify, and monitor their value chains, allowing them to tackle issues head on and build transparent processes,” explains Katrin Ley, Managing Director of Fashion for Good. With testing underway to trace organic cotton from farm to gin, the next step will trace from gin to consumer and finally it will need to be proven at scale. If taken to this level, this initiative has potential to become a leading end-to-end traceability solution not only for organic cotton, but for other preferred fibres. “The time was ripe to take a bold step towards full traceability in the organic cotton value chain. We believe this technology solution has potential and are eager to support the experiment to prove it. It has been exciting to see so many actors come together and we invite more of the industry to join us on this journey.” adds Anita Chester, Head of Sustainable Raw Materials of C&A Foundation.